Department of Homeland Security Secretary Kirstjen Nielsen said monthly border apprehensions have returned to “previous levels” since dropping significantly after President Donald Trump took office. That’s true: There was a sharp rise in those apprehended at the Southwest border in March from a year ago, putting the figure back in line with 2016. But what about the long-term view? Apprehensions have been on a general downward trend since the mid-2000s. Nielsen made her comments on April 4 in announcing that the president would ask some governors to mobilize the National Guard to assist Border Patrol. “We’ve recently seen the numbers of illegal border crossings rise from 40-year lows last April, back to previous levels,” she said. There are technically no figures for those who cross the border illegally, but figures on apprehensions by CBP are used to measure such trends. Let’s look at those numbers in a broader context. 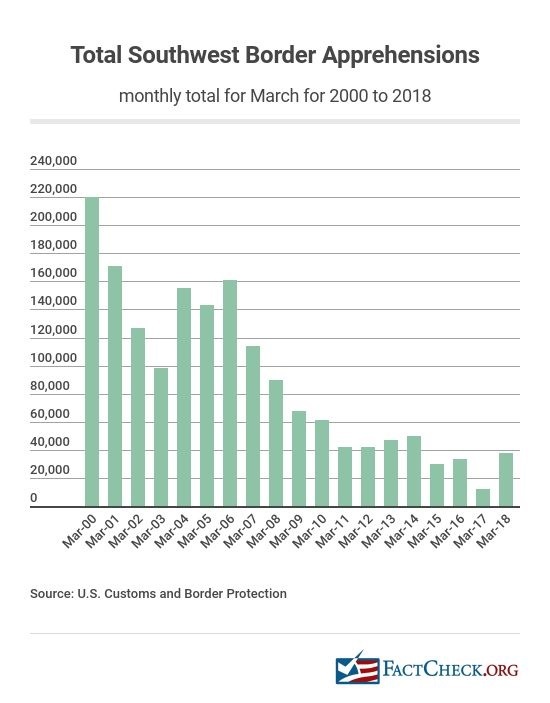 We’ll begin by comparing the latest monthly figure for apprehensions at the Southwest border in March with previous years dating to fiscal year 2000. 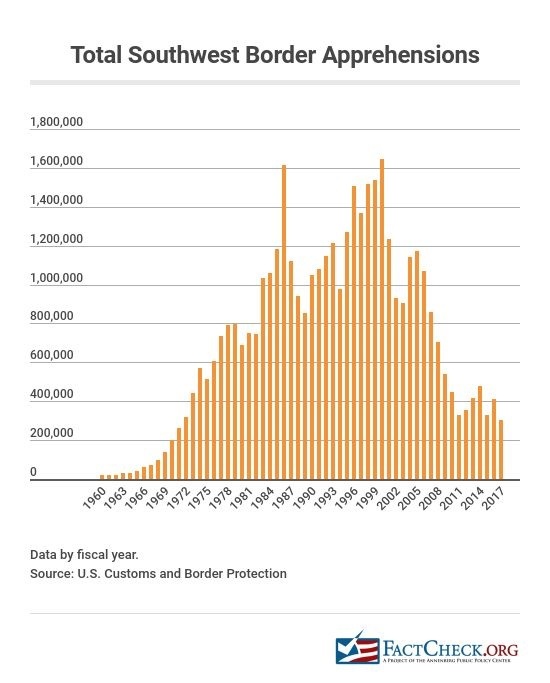 During that time, border apprehensions were at their highest in March 2000, with 220,063 people captured at the Southwest border. The numbers for March have fluctuated a bit, but have been on a general downward trend since 2006. We can look at the yearly totals — by fiscal year — going all the way back to 1960. Those figures show a peak of 1,643,679 apprehensions in fiscal 2000, with a similar high in 1986. Again, there has been fluctuation since 2000, but a general downward trend since the mid-2000s. In fiscal 2016, President Barack Obama’s last full fiscal year in office, total apprehensions on the Southwest border were 408,870. That number went down to 303,916 for fiscal 2017. Compared with the peak of 1.6 million in 2000, that’s an 82 percent drop. Fiscal 2017 included nearly four months under Obama and more than eight months under Trump, but the monthly breakdown shows that the decrease for the year came under Trump. “We’ve recently seen the numbers of illegal border crossings rise from 40-year lows last April, back to previous levels." Previous StoryQ&A: The Death Penalty for Drug Trafficking?